FLORIDA CITY, Fla. — “Daddy look!!! There’s another alligator!” Brian Sears, age 7, shouted pointing at the rippled surface of the water at the Anhinga Trail in the Everglades National Park. Most kids, as well as adults, are excited to catch a glimpse of an alligator but Sears has grown up with a greater appreciation of the animal than most kids. 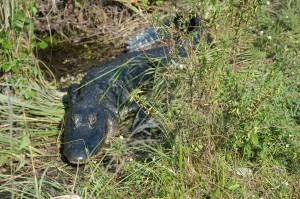 An alligator rests on the bank of a canal in Everglades National Park (Staff photos). About two decades ago, many animals in the Everglades National Park and Big Cypress National Preserve took a heavy hit from excessive poaching and hunting which led to many of the animals being placed on an endangered species list. Poachers and hunters previously captured, cranes, hawks, and especially alligators, with little to no regulation. According to the Environmental Protection Agency, in October of 1989, when American alligator numbers were at their lowest there were less than 200 of them living in the Everglades. 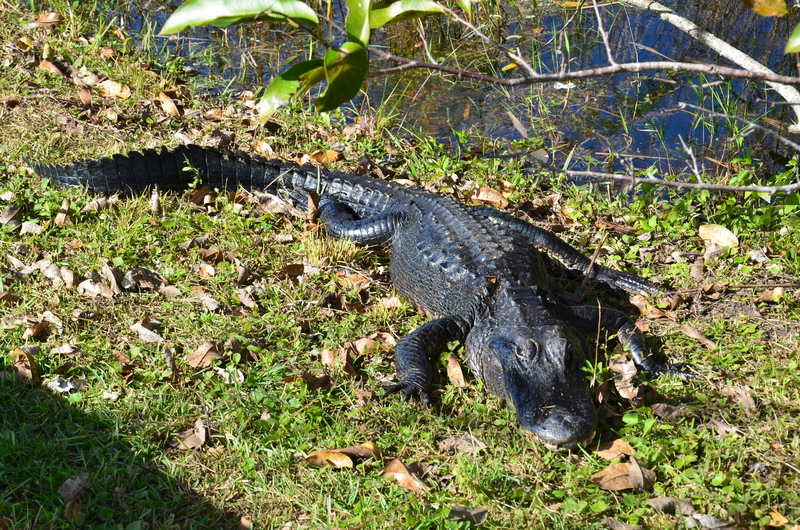 Thanks to animal rights organizations and park officials who have created a more informed public, there are more than 200,000 alligators in the Everglades and over 1.5 million in the state of Florida. The presence of alligators in the Everglades National Park is not the only exciting element about the park; the park is also the only ecosystem in the world where alligators and crocodiles co-exist side by side. Although alligators only thrive in fresh water because they can’t digest salt, crocodiles can live in both fresh and salt water. 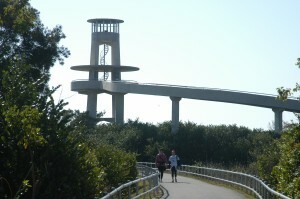 The Everglades is unique because fresh water in the Florida Bay meets the salt water of the Gulf of Mexico, creating a perfect ecosystem for both animals to live together. At right, an alligator lies in the sun. Below, the Shark Valley Observation Tower is a good place to spot alligators. Looking out over the Anhinga Trail, Bianca Chavez, 22-year-old park visitor exclaimed, “Look at those teeth! That thing could eat me in two bites!” While she may have been right that the alligator could indeed eat her in two bites, the animal would not do that. Beautiful and intriguing, these animals are often misunderstood. About 68 percent of an alligator is pure muscle. Male alligators can grow up to 12 feet and weigh 400 to 500 pounds and female alligators usually grow to eight to nine feet. As if these dimensions aren’t intimidating enough, the jaws of a gator have over 1,000 pounds of closing pressure. 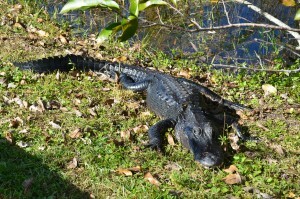 While an alligator certainly could eat a human is it wanted to, this is not in the alligators diet. The main diet of an alligator consists primarily of fish, but they also feed on turtles, mammals, snakes and birds. 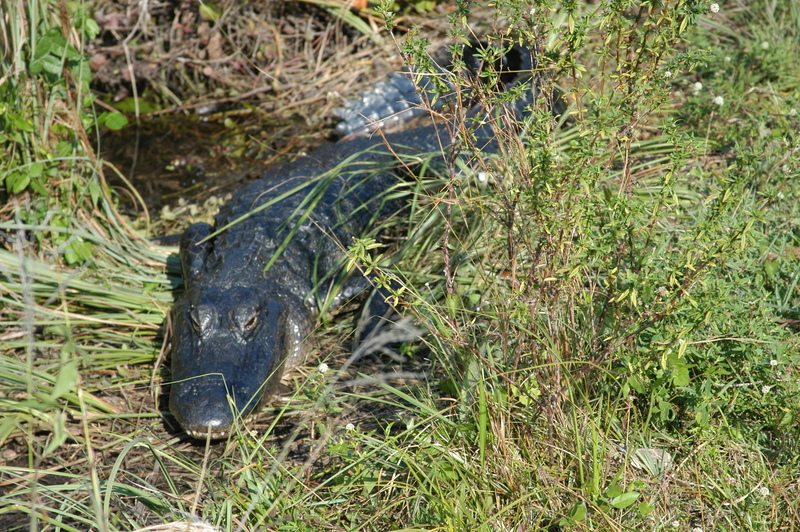 Most attacks on humans occur because the animal feels threatens, gators are territorial and frequently get into fights defending their space. With around 80 teeth at a time, alligators lose or wear down teeth over their lifetime, which are quickly regrown. With a life span of 30 to 35 years in the wild and 50 years in captivity, an alligator may go through 2,000 to 3,000 teeth. Thanks to legal protection, alligators are no longer endangered but they are still classified as threatened to insure continued protection. The Everglades National Park is quite literally crawling with alligators and provides visitors with spectacular views of these incredible animals.